The next meeting of the Planning Committee will be at 7.30 pm on Monday, 3rd December 2018 in the Stanton Hall. Members of the public are very welcome to attend. The next meeting of the Planning Committee will be at 7.30 pm on Wednesday, 21st November 2018 in the Stanton Hall. Members of the public are very welcome to attend. 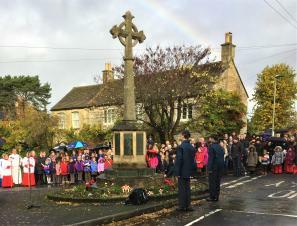 We have uploaded some pictures of the Remembrance Day ceremony that took place at the War Memorial in Charlton Kings on 11th November 2018. The pictures can be viewed at the Gallery page on our website. The Charlton Kings Civic Service of Remembrance will take place from 9.50 am on Sunday, 11th November at the War Memorial. All are warmly invited to attend. A copy of the service sheet is attached. HTML5 validated. WCAG compliant. Page generated in 0.146 seconds.